Dr. Peter Edwards, co-owner of Columbus Crew, examining a patient. “We’re going to put the team in a position to be successful," Edwards said in an interview with WOSU. "We really want to have a wonderful venue so that the game day experience is top-notch." Along with the Haslam family, Edwards recently purchased the Crew for $150 million with the intention of keeping them in Columbus. The partners also plan to spend $230 million for a new stadium in the Arena District. “As people become aware that it’s different now and that the commitment there is different now, we think that it will be really exciting for people to come and see a game,” Edwards says. Although he will continue his busy private practice, since purchasing the team Edwards has stepped down as the Crew’s team doctor. He held the position since Major League Soccer started in Columbus in 1996. Now, one of Edwards’ associates will take over. “I’ve been pretty closely involved with soccer and the Crew for the entire existence of The Crew, so I’ve been a huge fan my whole adult life, almost,” Edwards says. Edwards grew up in Upper Arlington and attended schools in the Columbus suburb, but he never played soccer. While an undergraduate student at Vanderbilt University, Edwards played varsity tennis but injured his ankle and wrist. He returned to Columbus where he finished his education at The Ohio State University. 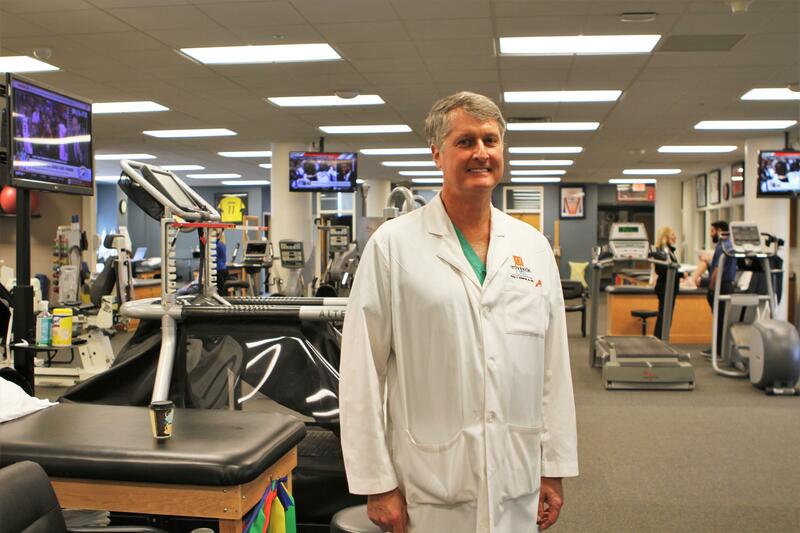 Dr. Peter Edwards in the physical therapy room. Edwards says he met the Haslam family when they began looking to buy the Columbus Crew. “A lot of the NFL ownership groups are looking at soccer because it’s a growing sport and the popularity is expanding and there’s a lot of excitement around the sport, especially with the World Cup coming in 2026,” Edwards explains. Edwards would not disclose the exact percentage his family owns of The Crew. Edwards says he will leave the team management decisions to the professionals. The new stadium will be part of the Confluence Village development in the Arena District, with construction starting as early as this summer. Columbus, Franklin County and state officials have all pledged their financial support in the downtown development.